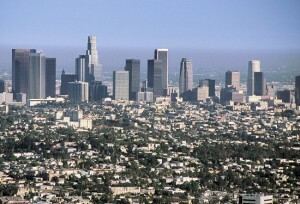 Can Los Angeles Ever be a Walkable City or Are People Happy With the Way Things Are? It is no surprise that there is a growing trend in worldwide to go more gree. Also, it is more popular than ever before for US cities to redesigin their urban structure to create more walkable communities, which will lead to a more sustainable future. Los Angeles is currently known for being a suburb city where residents rely on their car for transportation, not busses or trains. The question is, is it possible to convince Los Angeles residents to give up their suburb lifestyle and move to the city? Or at the minimum, welcome public transportation into their lives and reduces their reliance on motor vehichales? According to a recent column in the LA times, the Los Angeles residents and city officials are happy with the way things are and the majority are not open to change. The author Christopher Hawthorne talks about how he sees a growing number of people opposed to a more pedestrian friendly Los Angeles. There is a real divide in what people believe should be the future for LA. A recent event, the CicLAvia event, closed 7 miles of LA streets to motor vehicals and only allowed pedestrians and bikers. This event proved to be very successful as many took a liking to seeing the city with walkable streets. In recent years rail systems have been expanded and there are plans for the public transportation to be expanded and extended even more. Despite these progressive moves forward, there are many others who are fighting developing the rail and oppose creating new denser housing developments such as Eco Park. The future urban infrastructure of LA is sure to be a social and political issue for the next several years. The question is: Should Los Angeles should head in the direction of so many other cities and grow into a dense urban walkable city or should it remain the “suburban metropolis” that it is today?